Excluding 'fluffy' or 'puffy' gas giants that are 'inflated by heat from their stars, what is the maximum radius of a gas giant planet. I keep reading things like "...Jupiter is 'about' as big as they get...", but I can't seem to find a specific number to go with that word "about". Assuming a gas giant was made up of the highest plausible ratio of Hydrogen, and the lowest plausible ratios of other elements (and not significantly heated by the star), just how big could a gas giant get before it started shrinking again under its own weight/gravity? Is it really just 1 Jupiter radius? 1.0001? 1.1? 1.3? According to the models of Mordasini et al. 2012 it is about 13 Earth radii (about 1.2 Jupiter radii) for gas giants older than a billion years. Younger gas giants that are still contracting significantly can be bigger. How much bigger is wrapped up in uncertainties in the formation mechanism and the core mass and composition. 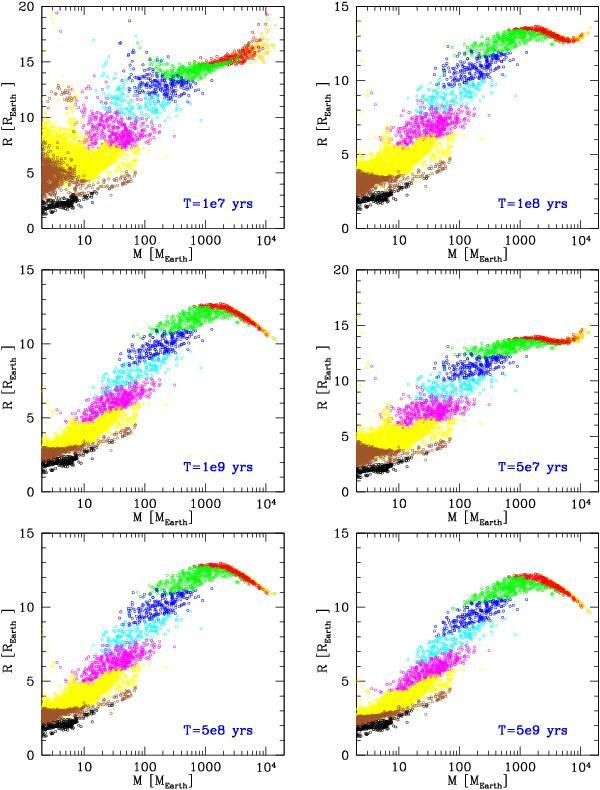 Gas giant mass-radius relationships from Mordasini et al. 2012. The colour coding corresponds to the fraction of heavy elements in the planet. The larger planets have smaller fractions of heavy elements. Not the answer you're looking for? Browse other questions tagged planet gravity astrophysics exoplanet gas-giants or ask your own question. What is the long term fate of the gas giants? Are gas giants supported by thermal pressure? Is carbon dioxide gas giants possible? Could binary gas giants have ring and moon systems? Where do gas giants end up?